Science Fiction | Shelf Elf: read, write, rave. It’s my pleasure to welcome Malindo Lo back to Shelf Elf. Malinda is here to give us a behind the scenes look into the creation of the book trailer for her new release, Adaptation. Over the past few years, book trailers have become quite a thing in YA. I’ve never been entirely sure if they succeed in making people want to read a book, but I’ve been fascinated to see how book trailers have developed. They used to be slide shows of still photos with text — remember 2009? But recently, some book trailers have become elaborate productions with casts, crews, costumes, and very! dramatic! music! I wasn’t initially planning to make a book trailer for Adaptation because I didn’t think I was up for such a big ordeal. However, when I saw the book trailer that author Nina LaCour shot for her novel The Disenchantments, I thought: Whoa. That is the kind of trailer I would like! So when I learned that Nina and her friend, Amanda Krampf, had launched a mini book trailer production company, Less Than Perfect Productions, I knew that I wanted to hire them to make a trailer for Adaptation. Even better? Nina and Amanda live in the San Francisco Bay Area, so we could work on this in person. While many book trailers have text crawling across the screen, I knew that I wanted to have a voiceover narrator. I took the text that is excerpted on the back cover of Adaptation and built the voiceover narration around that, because I thought it expressed the novel’s premise pretty clearly. Then, Nina, Amanda, my editor and I thought about various images that could convey some of the things that happen in the novel. In one of the scenes in Adaptation, the main character attends a funeral at Cypress Lawn Cemetery in Colma, CA, which is just south of San Francisco. (Notable fact: Colma was founded in 1924 as a necropolis; 1.5 million people are buried there. Also, nobody is buried in San Francisco anymore — they’re all in Colma.) When I was writing Adaptation, I visited Cypress Lawn as part of my research. It has a giant, beautiful mausoleum that looks like a palace. I suggested that we film part of the trailer on location at the mausoleum, where we could shoot the main character running after a man in black within the mausoleum itself. I thought it would not only look gorgeous on film, it would look creepy, and I wanted to make sure the book’s creepy vibe came through. This entry was posted in Science Fiction, Teen/YA and tagged behind the scenes, book trailer, Little Brown, malinda lo on September 20, 2012 by shelfelf. Malinda Lo’s latest, Adaptation, is a Sci-Fi Thriller Romance which means it has aliens and conspiracy theories and kissing. Sound fun? It is. Oh, and if you have ornithophobia (fear of birds), then it might not be for you. There are some scary birds in this book. In fact, that’s where the story starts. Reese and her debate partner, David, are stranded at the airport with their coach on the way home from a tournament. A series of plane crashes, reportedly caused by large bird strikes, causes all flights to be cancelled and airspace to be closed until the authorities can be sure they understand the circumstances of the crashes. So the three rent a car to drive back home, only as panic builds in the general population, the roads are far from safe. Reese and David end up driving alone on the Extraterrestrial Highway and then another accident happens. A bird flies into their headlights and they crash. When they wake up in a military hospital in Nevada, no one will give them much information about their injuries or the treatment they received, and they must sign nondisclosure agreements before they can go home. They can’t even tell their parents about what happened to them. Keeping everything secret only gets harder when the massive scars from Reese’s injuries fade so quickly she can’t believe it, and she begins to have strange sensations that she has never felt before. Then she meets Amber, who is mysterious and beautiful and a welcome distraction, and Reese begins to have other feelings she’s never experienced, which is confusing enough, but even more so given that until Amber, she’d thought she was crazy about David. What really happened to Reese and David, and what are the implications for their futures, and for society at large? 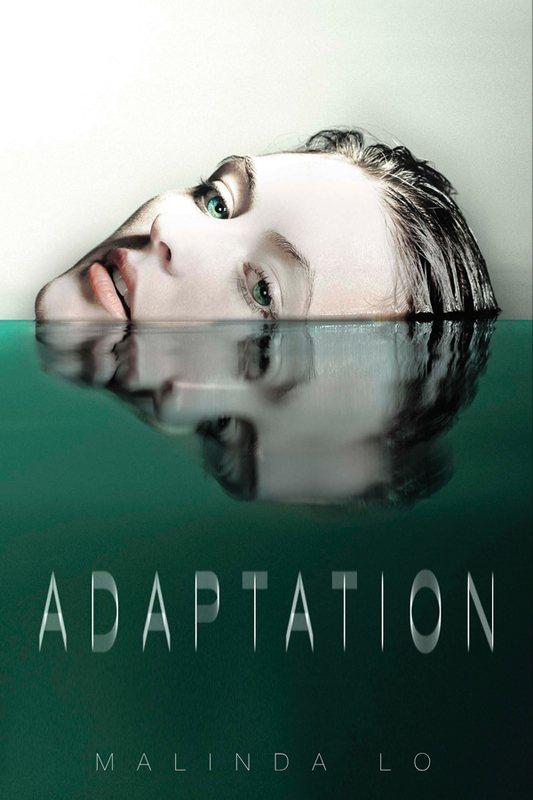 The opening of Adaptation is super suspenseful and tension builds immediately. Lo does a brilliant job capturing the fear and the increasing panic after the bird attacks. You’ll be turning the pages fast. The pace does slow quite considerably once the romantic plot thread with Amber is introduced, and while you have to adjust to this a little bit, I think that the shift in pacing is true to Reese’s situation. It is entirely believable that she would throw herself into this new relationship as an escape, in order to feel something other than fear and worry. Also, the fact that her relationship with Amber gets a lot of focus makes it more believable and nuanced than I think it otherwise would be if it was introduced only in passing. I was surprised that it took centre stage, but not disappointed, as I think that their relationship mirrors and develops some of the themes Lo explores in the main plot: isolation, self-discovery, secrets, and connection. There’s a sequel coming next year, and good thing too, because that ending is about as cliff-hanger-y as you can get. Adaptation is published by Little, Brown. This entry was posted in Science Fiction, Teen/YA and tagged aliens, Brown, Little, malinda lo, sci fi, teen on August 31, 2012 by shelfelf. 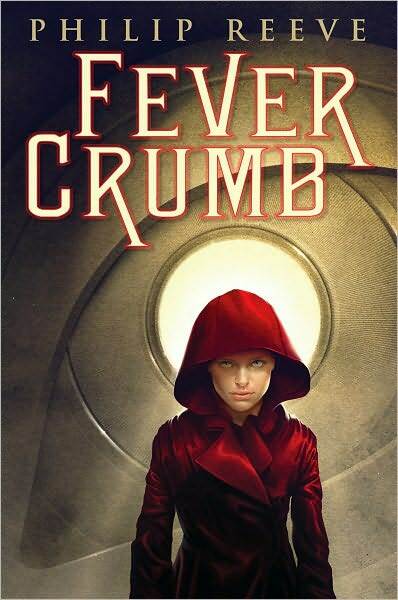 Philip Reeve’s Fever Crumb is a book to sink into. For some of you, all I really need to say is “Prequel to the Mortal Engines Quartet” and you won’t feel it’s really necessary to read any more of this review. That would make you already a Philip Reeve fan. That would mean that you know that a Philip Reeve book is all about amazing world-building, creative vision, and characters as quirky and rounded as they come. A Philip Reeve book is a truly transporting experience. If you haven’t yet read any of his work, I’d say Fever Crumb is a fine place to begin. Fever Crumb takes place far in the future, a few centuries before the first book in The Hungry City Chronicles. Fever is a girl who was abandoned while she was still a baby, and raised by the Order of Engineers, scientists for whom logic is all. Years before this happened, Auric Godshawk, a powerful ruler and member of a strange social class known as the Scriven, was deposed during a violent uprising. Things haven’t really been stable in London since that time. When she’s nearly grown up, Fever is sent to work with an archaeologist named Kit Solent who believes that he may have found Godshawk’s secret laboratory, where he hopes he may uncover amazing scientific secrets. At the same time, invaders are drawing closer to London’s borders, and they have plans of their own for the city’s future. Where to start with why I loved this book? First off, there’s an appealing Dickensian quality to it. I think it has something to do with the way that the atmosphere is alternately gritty and then suddenly funny, and how the characters are perfectly captured in their smallest gestures and interactions with other characters. You will feel like you are reading a real tale, a little bit old-fashioned in feel and grand in scope. And the world-building. One word: incredible. Every aspect of the London of Reeve’s imagination is right there for you to picture and smell and hear. Reeve is one of those amazing authors who manages to convey attention to the smallest details (the Scriven’s facial markings, the scent of a summer night), the kind of small details that make a world come to life for the reader, but at the same time, his big-picture world-building is remarkable and consistent. The story moves at such a pace but you never feel that you aren’t getting a sharp, fully-realized picture of things. His inventiveness is apparently unending. One of my favourite examples of this? There are these spooky/fantastic paper assassins that feature at several points in the plot. Just when you thought the mail slot was safe. Of course, for those who are already wild fans of The Hungry City Chronicles, there is a great deal of additional appeal as you will discover in Fever Crumb more about the origins of traction cities, as well as the history of some of the characters featured in that series. I think Philip Reeve is masterful in how he develops different story threads, always knowing when to leave one to return to another but never leaving anything for so long that you stop caring about it. Every plot line gets its fair share of development and care, making for a rich reading experience. If you’re still reading this review, and you haven’t raced away to get your hands on this book, check out this mini interview with the author. And then hurry off and get your hands on this book. Fever Crumb is published by Scholastic Press. And it’s worth every second. (This post is cross-posted at Guys Lit Wire). This entry was posted in Middle Grade, Science Fiction, Teen/YA on May 21, 2010 by shelfelf. There’s been so much talk over the past few months about Rebecca Stead’s second novel for Middle Grade readers, When You Reach Me. Buzz, buzz, buzz. Awards whispering. I’ve read it and I loved it, just like everyone else. Certainly, When You Reach Me makes book people look at Stead as a writer with many, many books in her future, and it’s the sort of book that should make readers wonder what she’ll write next. I decided to read First Light because I was so impressed by When You Reach Me. As it turns out, Stead’s first book has tremendous merit as well, and is in many ways, as creative and finely wrought as her latest novel. 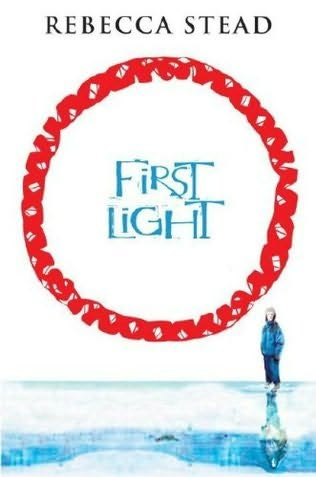 First Light may be science fiction, but it is a story that is incredibly timely, as the “real world” thread of the narrative focuses on a boy whose scientist father is studying global warming. Peter is thrilled at the chance to travel with his parents to Greenland, where his father will be conducting field work. His mother is also a scientist, who studies mitochondrial DNA. For as long as Peter can remember, she has suffered from terrible, debilitating headaches that seem to shift her whole mood towards a sadness no one can penetrate. As the family is caught up in preparations for their journey, Peter begins to experience more frequent headaches himself, sometimes accompanied by strange visions. He wonders if he has inherited some secret illness from his mother, but neither of his parents ever speak to him about his mother’s headaches, and Peter wonders if there is a something serious that they are keeping from him. He doesn’t realize it, but this trip to Greenland will take him to the heart of the mystery he is only beginning to sense. The second thread of the narrative belongs to Thea, a girl who lives underneath the arctic ice in a community forged by a hunted people, generations before her. Her ancestors came to live in Gracehope, a secret world that they build under the ice, and ever since then, they have feared the outside world. Thea is not afraid, however. Rather she dreams of seeing the sky and the horizon and the constellations she has only read about. She wants to travel to the surface, but to do so, she must act in secret, turning against the wishes of many elders in Gracehope. Peter and Thea are destined to meet, and when they do both find answers to questions they didn’t even know they had. This entry was posted in Middle Grade, Openmind, Science Fiction on October 29, 2009 by shelfelf. There’s nothing like a book about a catastrophic world event to make the prospect of having to write 60 report cards seem like not such big a deal after all. Guess that might have been what inspired me to read the dead and the gone last weekend. The only break I really took from report card purgatory was to read Susan Beth Pfeffer’s vision of what would happen to the world if an asteriod hit the moon and knocked it out of orbit, causing tsunamis, widespread volcanic eruptions that block the suns rays, earthquakes, flu and cholera. Good times all ’round. In fact, I was so into the whole thing that this week I picked up the companion title, Life As We Knew It, and found myself just as compelled to keep turning the pages. Life as We Knew It is structured as the diary of Miranda, a high school sophomore. Miranda details her family’s struggle to survive after a meteor smashes into the moon, moving it out of orbit and causing all sorts of horrible changes in the earth’s climate and environment. We are right there as she recounts the loss of electricity, heat, running water, diminishing food supplies and the many terrifying issues in the world at large: volcanic eruptions, floods and epidemics. 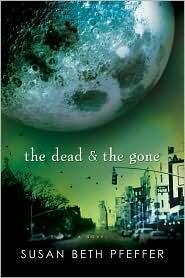 In the dead and the gone, Pfeffer sticks with the same basic scenario, but shifts her lens to take in a new perspective, this time the experience of a family in New York City trying to cope with the aftermath of the same disaster. Seventeen-year-old Alex Morales is left as the primary caregiver for his two younger sisters when both his mother and father disappear after the catastrophe. The day-to-day account of their lives is similar to LAWKI, except not in first-person narration. I can see why these books have met with critical acclaim and plenty of reader enthusiasm. Pfeffer conveys how terrifying the events are for her characters in a way that is honest and unflinching. You are brought right into it, up close to the darkness and the fear, but never to the point that you get lost in it and can’t take it anymore. That’s a tricky balance to have achieved with such an intense premise. More than anything, Miranda and Alex are incredibly sympathetic characters, so believable in their complicated responses to the challenges they face. You watch them grow, and you ‘re right inside their heads. Another reason why these novels just grab you is that there is a continuously building claustrophobic sense as the characters are more and more cut off from the rest of the world and it becomes all about their thoughts and emotions wound so tight. “Unputdownable,” that’s for sure. Susan Beth Pfeffer has a wonderfully detailed blog in which she offers a glimpse into her writing process, and lots of behind-the-scenes info about all of her books. These two titles are about hope and desperation, faith and resourcefulness, courage and forgiveness and ultimately, the power of family to lend meaning to life. There are many scenes I will not forget in these pages, images that will stay with me for a long time. I’ll be up for some more catastrophe when Susan Beth Pfeffer has finished the third book in the sequence, The World We Live In, which continues Miranda’s diary from the point it ended in the first book. This entry was posted in Science Fiction, Teen/YA on March 4, 2009 by shelfelf. 1) She wrote The Hunger Games, which in case you’ve been hiding in a cave somewhere since October, is her much-acclaimed first novel in what will be a trilogy. (Thank goodness). 2) She adopts feral kitties and one of them is named Zorro. (Pause here to create mental image of claw-slashing, rapier-wielding, masked kitty cat of mystery). 3) She has a big wooden bat hanging in her kitchen window. (Enough said). So kitties and kitchen bats aside, my purpose here is to spend a little more time considering #1from the list above, because it is very important that everyone (and I mean everyone) out there understands why The Hunger Games is one seriously fantastic read. Imagine the world after North America is long gone. Panem, a dictatorship divided into 12 Districts, is ruled centrally from a powerful city, known as the Capitol. Life in most of the districts is harsh, and that’s putting it mildly. Citizens work themselves to the bone for next to nothing, with the fruits of their labors heading straight to the wealthiest members of society. Just when you think things couldn’t get much bleaker, once a year, 2 young people, a boy and a girl, are chosen by lottery from each of the 12 districts to compete in the Hunger Games, the most twisted reality TV show you could ever imagine in which the contestants battle each other to the death in an enclosed territory known as the “arena.” The last contestant, or “tribute”, left alive is set for life, with a luxurious home and a lifetime of security and wealth guaranteed for their entire family. The protagonist is Katniss Everdeen, who hails from the Seam, District 12, a tough mining community that has not had a winning tribute for about 30 years. Katniss is a skilled hunter, and she comes to depend on this ability as she battles for survival in the arena. The second District 12 tribute is Peeta Mellark, the baker’s son, a stoic partner for the often impulsive, sometimes fiery Katniss. What happens to these two and the rest of the fighters when the game begins is sure to keep you up late, late into the night, turning the pages straight through to the dramatic finish. I had huge expectations for The Hunger Games, what with the glowing reviews cropping up right, left and centre. Let’s just say, I can’t imagine how I could have been more satisfied. Collins has plotted her narrative expertly; there is no excess here. 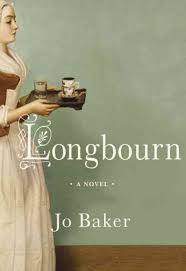 She tells a tale that is tight and swift and yet still manages to remain complex in its themes. About halfway through, I crawled out of my couch-nest and wandered into the kitchen and said to my fella, “I can’t think of any way this book could possibly end that wouldn’t be completely devastating. This book rocks.” (Back to couch). Here’s a book with substance and suspense, philosophy and big time page-turnability, well-crafted characters and most of all, the promise of even more story ahead. You’ve got injustice, extreme courage, sacrifice, romance, cruelty and the dream of a better world. That’s some story. Certainly not a light read, The Hunger Games will get readers talking. It begs the questions, “What would I do?” and “Who would I be?” I’d line up to have the chance to eavesdrop on a few conversations at teen book clubs, on the bus, in libraries, or around the dinner table as people consider what the novel means to them. 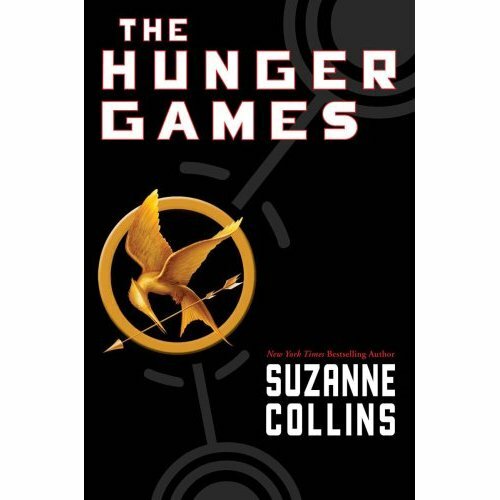 Ultimately, Suzanne Collins’s story explores the best and worst of humanity, the things about our society that make us shudder and the things that give us hope and feed our spirits in the darkest hours. So read it for yourself, give it to everyone you know, and then start crossing off the days on your calendar till the release of Book Two, in the Fall of 2009. The Hunger Games is published by Scholastic. This entry was posted in Adventure, Science Fiction, Teen/YA on November 24, 2008 by shelfelf. Today I’m pleased to host Chris Rettstatt, author of Kaimira: The Sky Village. He’s on a Blog Tour this week, and this is his second stop. So, welcome Chris! What tends to inspire you (situations / works of art / places / foods / people)? Music inspires me. Sometimes I’ll hear a song that strikes a deep emotional chord with me, and I’ll listen to it over and over, dozens of times, and then I’ll try to write a scene that strikes the same chord. The other thing that inspires me is losing myself in cultures very different from my own. What inspired you to write The Sky Village, and to create the Kaimira world? Did you just wake up one morning thinking, “Hmmm, perhaps today I will write about a flying city and teenagers who can conjure demonic creatures and communicate with each other using a magic book…”? I was thinking about science, how it’s racing toward places that would seem to us to be magic. Once we pass through to the other side, and we’re faced with a post-scarcity world (at least for those with access to advanced science), where will we find meaning and structure? So much of the structure of the world we know now is tied to limitations. When those limitations vanish, my feeling is that we’ll look to mythology of various sorts for meaning and structure. So Kaimira emerged as a hybrid of science and mythology. This is impossible to answer. If Lord of the Rings had been published as a single volume, as originally intended, I’d have to choose it, simply due to the impact it’s had. If you could live inside a kids’ book, which book would you choose? Where the Wild Things Are. Every day a wild rumpus and back home in time for dinner. How tough was it to create a rich, realistic fantasy world that would appeal to hard-core, Sci-fi/Fantasy fans, but that would still be accessible enough to engage typical readers too (i.e. those unaccustomed to enjoying books about biotech chimera)? Putting it that way, it sounds really tough. But from the beginning I wanted the book to be a Sci-Fi story that feels like a Fantasy. I felt like this approach would fit best with the science-meets-mythology themes in the story. If this approach also makes the book appealing to a wider range of readers, I’ll be very excited about it. I never thought Kaimira would appeal to everyone, but I do know the sort of person I’m writing for, and there are a lot of us. How do you hope that the online aspect of your work, at www.kaimiracode.com, will enrich readers’ experiences of the world you’ve created? The website currently has short pieces I wrote that provide glimpses into different parts of the overall Kaimira story, from stories about Dragonfly and Breaker as they would appear in the Tree Book to journal entries written in the Kaimira Code. Once we’ve rolled out the more interactive elements of the site, readers will be able to help build out the storyverse in a number of ways, from fan fiction to gaming. Can you imagine this sort of cross-media initiative working as effectively in other genres, not just Sci-Fi or Fantasy? It does work for other genres until you start getting into gaming. Sci-Fi and Fantasy tend to have pretty solid building blocks for gaming, but there are other genres that have it as well, such as thrillers and military action. But I think there’s just something about Sci-Fi/Fantasy fans that attracts them to big, immersive stories. Maybe there’s a Sci-Fi gene we haven’t discovered yet. I think that The Sky Village has the potential to appeal to both teen boys and girls because of the strong male and female characters, awesome action sequences and rich thematic elements. However, I can imagine some might think the series is pitched more towards boys (gaming tie-ins, focus on weaponry, fight sequences etc). I’m interested to hear your thoughts concerning “boy vs. girl” stories. During writing, were you consciously working to keep the narrative as gender neutral as possible? It’s true that some have said the series seems to be skewed more toward boys, but there are others who say it’s more girl-focused. The truth is that I didn’t think much about gender when I was writing The Sky Village. I thought more about the kinds of readers I was writing for, the ones who love to get lost in a story and who, once it’s over, find creative ways to keep that experience alive. What part of The Sky Village are you most proud of, because you think it’s the most creative or dramatic or just plain fun aspect of the book? The chapter where the Sky Village encounters a storm. This was a late addition. I met with a group of students who gave me feedback on an earlier draft of the story. One of the students asked what would happen if the Sky Village ran into a storm. I thought it was a great question, and it lead to the creation of that chapter. And I had so much fun writing it. This first novel in your series doesn’t present science and technology in the most positive light. What drew you to write about the destructive potential of these fields? It’s true that science isn’t shown in the best light in The Sky Village. But Mei’s and Rom’s powers, and the Tree Book, are all products of the same science. With the right wisdom and balance, this wonderful and terrible technology might be put to more harmonious use. If you were forced to engage in a little gladiator-style fighting yourself, which element – human, beast or mek – do you think would likely dominate in you? People who know me would probably say mek because I tend to stay very calm and focused. But in truth, I’d have to say human. When logic fails, there’s nothing like human instinct to carry you across the finish line. Thanks so much to Chris for stopping by Shelf Elf. Tomorrow’s stop on the tour is at a wrung sponge. On Friday, you can read my review of The Sky Village at Guys Lit Wire. This entry was posted in Fantasy, Interviews, Science Fiction on July 15, 2008 by shelfelf.